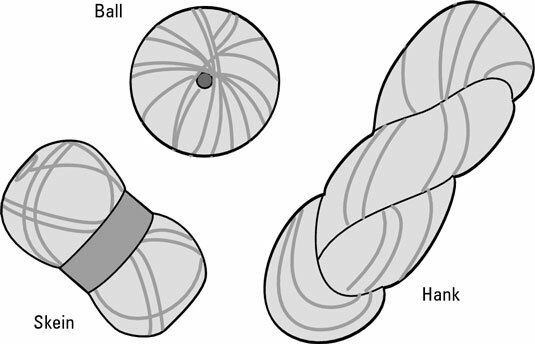 Yarn is packaged (or put up) in different forms: balls, skeins (rhymes with canes), and hanks. The differences in yarn packaging shouldn’t have much effect on the yarn you choose, but the shape does determine how you work with them. Ball: Yarn that’s . . . well, wrapped into a ball shape. Skein: Yarn wrapped in a loose twist. Yarn packaged as balls and skeins come ready to knit. After you find the end, you can cast on and go. Hank: Yarn wound into a large circle and then folded. You need to wind hanks into a ball before you can use them. If you try to knit with the yarn in hank form, you’ll quickly end up with a tangled mess. Your local yarn store may offer a winding service to convert hanks of yarn to balls by using a yarn (or ball) winder and a swift — two pieces of equipment that allow you to make an easy-to-use “cake” of yarn that sits flat while you knit it. If you find yourself with many hanks to wind, you can even buy your own winder and swift! Knit or crochet with the yarn end that comes from the inside of the skein or ball. This way, the skein or ball will remain in place as you knit and not roll around the floor. If you’re lucky, the yarn already will be center-pulled — the inside end will be pulled to the outside — easily identifiable and ready to go. If not, you have to reach in and pull out a small hunk of yarn in order to find this end and then rewrap the extra.